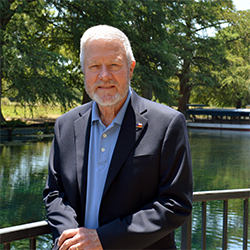 Renowned conservationist Dr. Andrew Sansom, Research Professor of Geography and Executive Director of the Meadows Center for Water and the Environment at Texas State University, is the keynote speaker for the Saturday evening banquet at the Palacios Educational Pavilion. He is a former Executive Director of the Texas Parks and Wildlife Department and Executive Director of the Texas Nature Conservancy. As director of the Meadows Center at Texas State University, Dr. Sansom coordinates university policy and research related to freshwater resources, manages the headwaters of the San Marcos River; administers the most extensive freshwater environmental education program in Texas; and supervises the training and coordination of more than 1,000 volunteer water monitors in rivers and streams throughout the State. Dr. Sansom’s environmental ties to Matagorda Bay are significant. In the early 1970s he initiated efforts that resulted in the creation of the Matagorda Island State and National Wildlife Refuge, and in the 1980s completed acquisition of the last 13,000 acres of privately owned land on the island to add to the refuge. He acquired East Matagorda Peninsula for the State in the early 1980s, initiating efforts that resulted in the establishment of the Nature Conservancy of Texas’ Clive Runnels Family Mad Island Marsh Preserve and the adjacent Mad Island Wildlife Management Area managed by Texas Parks and Wildlife. During the 1980s and 1990s in nearby Brazoria County, Dr. Sansom acquired additions to the San Bernard National Wildlife Refuge and the Brazoria National Wildlife Refuge, as well as lands in the Columbia Bottomlands and Marshes that became the Stringfellow Woods Wildlife Management Area and the Justin Hurst Wildlife Management Area. Before leaving Texas Parks and Wildlife, he acquired the Levi Jordan Plantation, which is now an historic site managed by the Texas Historical Commission.